Our goals in this prose workshop include the following: to generate new material, engage in systematic and constructive critique, pursue your interests, refine your writing, practice your craft, revisit your ideas about your genre(s) and your current project, furthering your thinking about both, and to develop and refine an aesthetic, keeping in mind visual artist Robert Rauschenberg's comment "Anything you do will be an abuse of somebody else's aesthetic." Each student will workshop new material three times this semester. That means material never-before-seen by a previous workshop. We'll also read and discuss the work of visiting and other contemporary writers. Analyzing and interpreting literary texts with a focus on issues important for writers, especially craft. Focus this term includes analyzing the "Imaginative Gap" between text and readers and how it can be provoked and manipulated by the writer. Criticism as well as creative compositions are produced. This graduate course is designed to give space for you to explore and further develop your writing projects. Each week we will complicate a different element of craft—like character-building, nonfiction’s commitment to fact, and the necessity of plot—by exploring works that variously adhere to and break the rules of –if there are any!— writing prose. We’ll play, experiment, pose questions, and look at an array of (mostly, but not all) creative nonfiction, as methods for developing your writing, whether you write fiction, nonfiction, poetry, or some beautiful hybrid creature. We’ll explore a range of prose styles by writers including Claire Vaye Watkins, Myriam Gurba, Aisha Sabatini Sloan, John D'Agata, and Joan Didion as catalysts for your writing, converse with contemporary writers via Skype and/or in-person, try out some in-class writing exercises, develop a digital story, and participate in feedback sessions to generate ideas toward revision. We’ll also devote time to another important aspect of your time here at Miami: teaching. To do this, we’ll examine three types of craft essays and consider other teaching strategies. 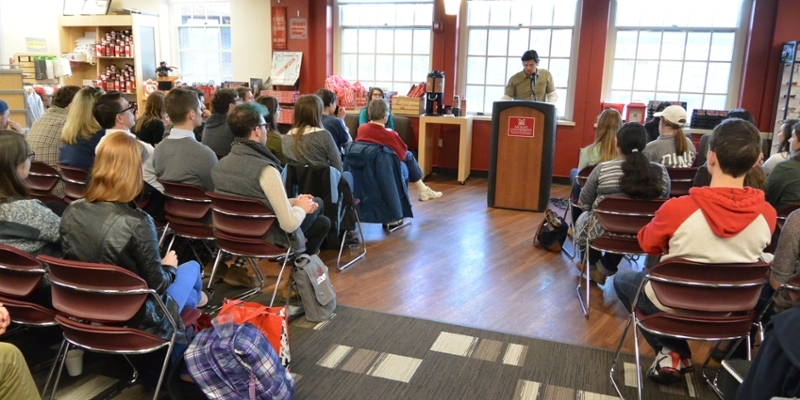 Attendance at visiting writers’ talks and readings are expected as part of the course. Study and practice in creative writing, with attention to formal and conceptual concerns. Attendance at visiting writers’ talks and readings is expected as part of the course. Emphasis on peer and mentor critiques of student work and on revision of a manuscript, with the goal of producing a portfolio of professional quality creative writing. The workshop in Spring 2018 includes discussion of (and exercises pointed at) writing that alternates between prose and verse (e.g., Tom Pickard's memoir Fiends Fell) as well as readings in poetic theory (e.g., Reginald Gibbons's How Poems Think) and innovative transatlantic poetry and poetics. Pedagogy of Creative Writing: Issues, Strategies, Techniques. Coverspractical strategies, theoretical concerns, and questions of politics and privilege. In preparation for teaching creative writing courses, participants will visit classes, build syllabi, and design and try out writing prompts, workshop formats, and student-teacher conferencing techniques. Readings will include texts by Janelle Adsit, PaoloFreire, Ngugi wa Th'iongo, Jenny Zhang, and others. In this seminar, students will be introduced to two complementary areas of research and theory. Threshold concepts are concepts critical for epistemological participation in a discipline; they are troublesome for learners, and not easily taught or assessed. However, they are essential for learners who wish to be able to "transfer"--or, more accurately--repurpose and build on what they learn, in order to make meaningful contributions within and across disciplinary communities of practice. Graduate students from all areas of English Studies who enroll in this seminar will examine their field's threshold concepts, perhaps engaging in crowd-sourced wiki projects with scholars from across the country, and consider how to design courses and assignments in their disciplines that promote deep learning across time and contexts. A class for all graduate students (fiction, creative nonfiction, poetry, literature, composition and rhetoric, fine art) keen to explore intersections between their own disciplinary genres and other disciplinary boundaries; e.g nontraditional, cross-genre structures of fiction, poetry, creative nonfiction, and intermedia. There will be opportunities both to collaborate and to produce individual work. Together, we will produce critical and creative responses to hybrid forms such as mutant journalism, the prosimetric (the prose poem, the haibun), short documentary, storytelling through word and image (photographic, graphic &c) sequences (online, on paper, on video), hybrid memoir, lyric essay, spoken word performance (both live and pre-recorded, monologue, poets theater, multi-voice sound compositions, podcast &c); by writers such as Claudia Rankine, Caroline Bergvall, Douglas Kearney, Lydia Davis, Coco Fusco and Guillermo Gómez-Peña, Atom-R, Black Took Collective, Kaia Sand, Anne Boyer, JR Carpenter and Jeff Sharlet, together with texts brought onto the class reading list by those taking the course. Assignments will only use available / lo-tec. No technical know-how required. Bring curiosity, generosity, and creative energy. The priority in this workshop will be your works-in-progress. You will draft, revise, read each other’s work and offer written and oral critiques. In addition, we will read four works of creative nonfiction and study, in-depth, the forms these authors have chosen from the lyric memoir to cultural criticism. We will focus on the techniques of creating a persona in a nonfiction text, crafting a story line from life events, and weaving research with scenes. Creative responses to texts and other brief writing assignments, both in-class and out, will supplement the readings and critiques. Study and practice in writing fiction, with attention to subtle aspects of character development, structure, story, point of view, figuration, tone, style, etc. Emphasis on group critiquing student work and on revising manuscripts, with the goal of producing a portfolio of professional quality contemporary fiction.